Here we are in another year — and another chance for me to make promises about being a better updater of this blog, of trying harder to use this space as an outlet for my thoughts and ideas on the game. And writing, like other pursuits, is one which is best kept fresh and in top form with regular practice and challenges. Yet, I’ve let it slide much too often. Finally, I’ve realized that because my job involves baseball around the clock (and writing about it in short form, like headlines and paragraphs), one of the last things I want to do in my free computer and blog time is to write more about it. So no promises this time, other than I’ll try. I’ve found a way to keep my photo blog fresh and interesting (to me, which is all I really care about), so perhaps something will strike me for this one, too. Today, though, I picked up a box of Bowman Prospects. It must be noted that a “box” today is nothing like it was in the late 80s when I was collecting. Then, a box contained 36 wax packs and cost about $16. Packs held 15 cards, giving you 540 cards in one box. The Bowman “box” I bought today at Target held seven packs of seven cards, for a mere 49 — and cost $20. 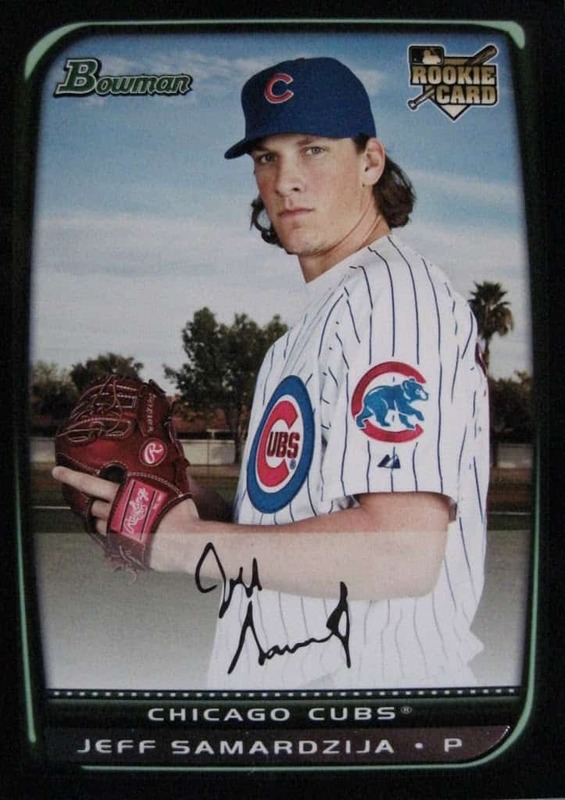 The purchase was for one main purpose — I hoped to obtain a card of Jeff Samardzija. 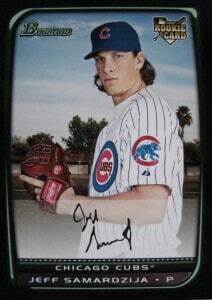 After opening about three packs containing various prospects whose names, if not faces, were familiar, I got a Samardzija in the mother lode of packs (for me, at least). Behind Samardzija’s square-jawed glare was Mets prospect Fernando Martinez, and behind him sat former New Jersey prep standout Rick Porcello. But then the next pack held the top card in the box. There was a chance that, in the seven packs I’d bought, I’d find a “relic” card (one with a piece of jersey worn by the player depicted) or an authentic autographed card. I got the second one, my first authentic autographed card of any kind obtained this way (in a pack of cards rather than at a ballpark). 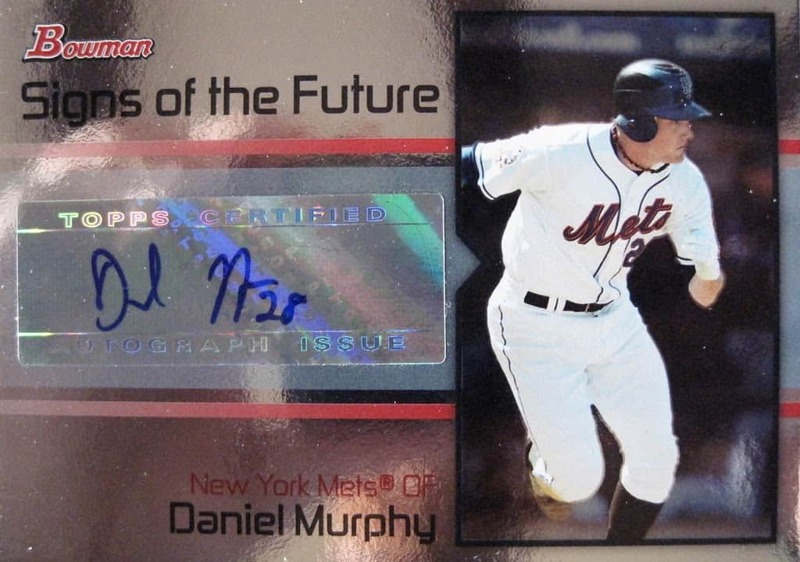 And as a bonus, it meant just a little bit more that it was of the Mets’ Daniel Murphy. I don’t actively collect cards anymore, but I do enjoy buying a few packs (or a “box” or two) each year. I’m sure I will again when the 2009s come out in February. And it’s finds like those today that make it worthwhile and bring back a little bit of the joy and excitement I felt in opening those wax packs and peeling the cardboard gum off the cardboard of a Mark McGwire or Will Clark on a 1989 Topps card.